The cup & handle is a bullish continuation pattern and is made up of a rounded bottom and a lever like structure. The pattern resembles a tea cup and indicates the probability of an uptrend in the price of an asset. Also called as the saucer and handle, this long-term pattern can range from several months to a year. The pattern is considered to be one of the strongest and reliable patterns. Thus, a binary options trader should not miss the opportunity to trade a cup & handle pattern. The entire pattern can be split into four different sections (please see the image) based on the price movement and volume. The pattern begins to develop when the market starts declining quickly. The downtrend in the price forms the left side structure of the cup. As bears get exhausted, the downward pressure on the price decreases thereby resulting in a sideways movement. The range bound movement forms the bottom of the cup. This is the period when the bulls take control and drive the price upwards. The strong uptrend forms the right-side structure of the cup. Once the price reaches the point where the decline (A to B) initially began, a state of equilibrium is reached between the buyers and sellers. This results in a small range bound movement resembling the handle of a cup. There should be a prior uptrend before the pattern develops. The cup should not resemble a ‘V’ shape. A ‘U’ shape is the ideal one. A shallow and not deeper cup is preferable. The handle formation should take at least two weeks time. The handle should exhibit a downward inclination. The handle should not extend below the top half of the cup. The 200-day moving average should not be broken by the handle. The volume should substantially rise when the price starts rising after the formation of the bottom of the cup. The probable target price is calculated by adding the distance between the highest high of the handle and the lowest low of the cup to the former. A binary options trader can purchase a 1min / 30min or 1hr call options contract soon after the price breaks above the handle acting as the resistance. The volume should rise when the break-out happens. A sharp rise in the price normally indicates a strong momentum. The contract will expire out of money only if the price falls below the handle, which by then would act as a support. A trader should monitor two time frames since the pattern takes several weeks to develop. For example, to purchase a 30min call options contract, a trader should monitor the weekly chart for the pattern completion and 1hr chart for entering at the right time. The volume should rise when the price breaks above the resistance (handle) line. The momentum should be strong enough to favor an upward trend. 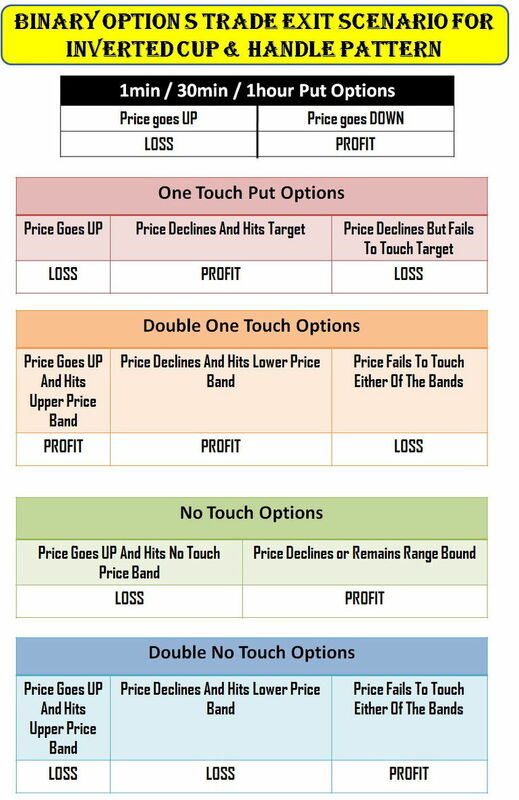 A binary options trader should enter a one touch options trade only after the price break-out (above the handle) happens. As long as there is no negative news to deter the uptrend, the options contract will expire in the money. This is arguably the ideal binary options contract for trading a cup & handle pattern. Once the price breaks above the handle (resistance) then a no touch options contract can be bought. Since a cup & handle pattern takes months to develop, the break out will be usually strong. Thus, a no touch binary options contract purchased after a break out will generally result in a profit. As it can be understood, the volume (increase) and momentum (strong) scenario should preferably support a further rise in the price of the traded asset. Unexpected negative news may result in a trend reversal thereby leaving the options contract worthless (expire out of money). A one touch call option may not yield the necessary result when the price breaks above the handle with negligible rise in the traded volume (or with a weak momentum). Under such circumstances, provided there is a scheduled high impact news announcement, a binary options trader can look into the possibility of purchasing a double one touch options contract. The high impact news would trigger a strong uptrend or decline in the price of the traded asset. 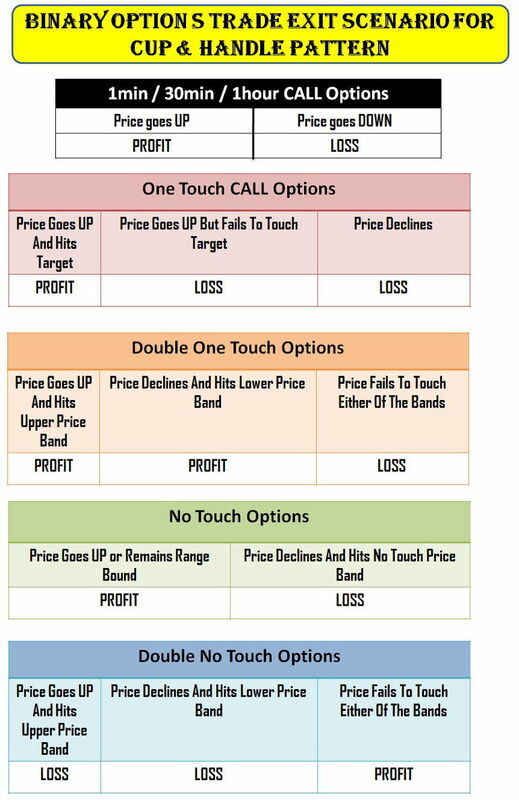 This would ultimately lead to the violation of either the upper or lower price band specified by the options broker thereby resulting in a gain (in the money expiry) from the trade. If the news does not alter the volume and momentum scenario then the price may remain range bound. That being the case, the options contract will expire out of money. Once the resistance level (highest high of the handle) is broken, the price will remain range bound because of the above discussed conditions. Thus, neither of the boundary prices set by the broker will be violated. Only fresh news can trigger further rise or reversal in the price thereby making the contract expire out of money. The inverted cup & handle, on the other hand, is a bearish continuation pattern. The pattern resembles an inverted tea cup. 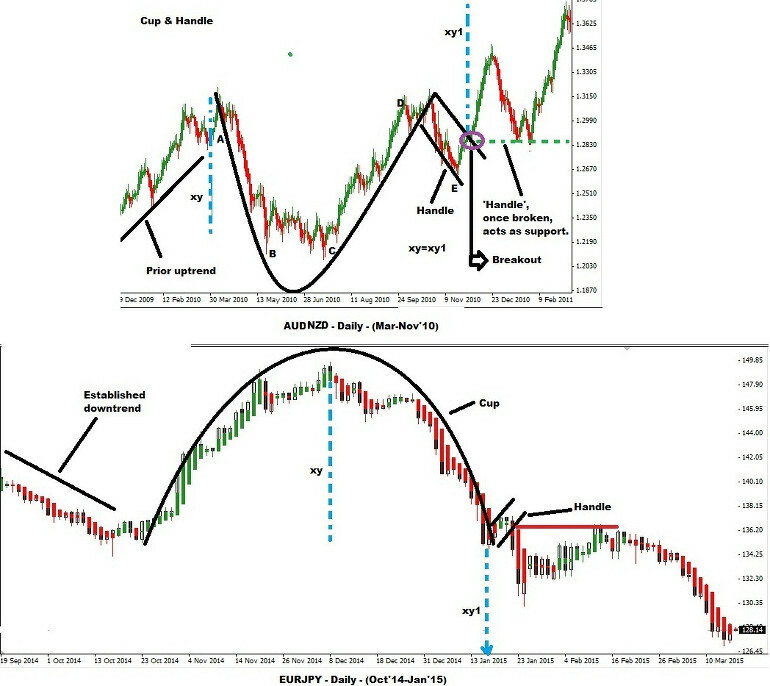 All other characteristics of the pattern are similar to the cup & handle pattern. Thus, an inverted cup & handle pattern is traded in the same manner as the cup & handle pattern. The distance between the highest high of the inverted cup bottom and the lowest low of the handle is measured and subtracted from the latter to arrive at the probable target price. In the case of an inverted cup & handle pattern, the price will break below the handle and decline further. Thus, instead of a call options contract, a binary options trader should purchase a 1min / 30min / 1hr put options contract or a one touch put options contract as the situation warrants. Considering the volume and momentum scenario, a trader can consider purchasing any of the other kinds of binary option contracts namely the no touch, double one touch and double no touch options contract. A cup & handle pattern does not appear often in charts. However, a binary options trader should be versatile enough to trade any kind of formation and the cup & handle pattern is no exception to the rule. It should be remembered that a trade is half-won with proper identification of chart pattern and precise entry. As long as a binary options trader is well prepared technically and emotionally, successful and consistent trading will not be a distant dream.